There were 36 total traffic deaths in D.C. last year, up from 26 three years before. Updated: Jan. 18, 2018 at 12:29 p.m.
Traffic fatalities in the District have increased every year since 2015. 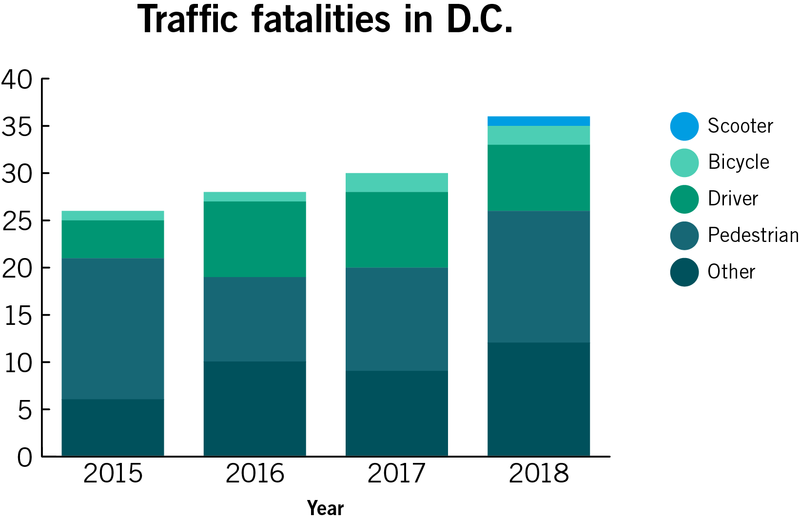 There were 36 total traffic deaths in D.C. last year, up from 26 three years before, Metropolitan Police Department spokeswoman Alaina Gertz said in an email. She said an increase in fatalities is likely related to the “sharp population increase” of residents in D.C., adding that the “rapid growth” of walkers, bikers and scooter riders has increased the number of people using roads previously dominated by cars. In total, 49 pedestrians, 27 drivers, six cyclists and one scooter rider have been killed over the past four years, MPD officials said. Since 2015, traffic-related fatalities for pedestrians, bicyclists and scooter riders have increased by at least two incidents each year. Between 2017 and 2018, fatalities increased from 30 to 36. Gertz said MPD has focused on increasing the number of arrests for driving under the influence over the past several years and has “enhanced” its impaired driver training for patrol officers, putting more officers on the road specifically trained to stop drunk drivers from harming others. “MPD will continue its training, enhanced enforcement efforts and educational outreach of all roadway users in an effort reduce the number of traffic fatalities in the city,” Gertz said in an email. 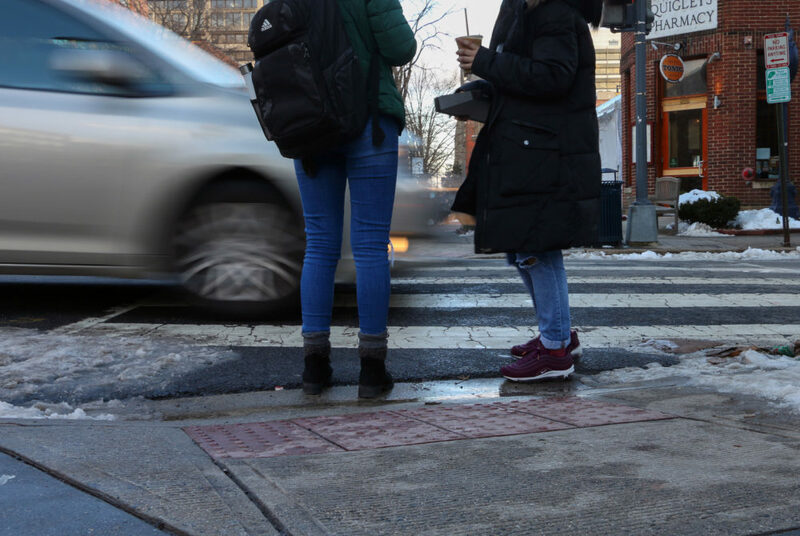 But the increase also coincides with Mayor Muriel Bowser’s Vision Zero plan, which aims to eliminate motorist and pedestrian fatalities and serious injuries by 2024. The District Department of Transportation announced plans last month to launch new safety measures to support Vision Zero, like banning right turns at red lights. Bowser tapped Linda Bailey, the former executive director of the National Association of City Transportation Officials, to head the District’s inaugural Vision Zero Office on Wednesday. George Branyan, the manager of the active transportation branch at the District Department of Transportation, said every fatality is “one fatality too many,” but the number of traffic-related deaths in D.C. is “relatively low.” He said there is “some amount of randomness” that contributes to traffic fatalities, so it is difficult for officials to predict and prevent traffic incidents. He said the uptick in fatalities represents “relatively low numbers” that can “swing wildly for no particular reason,” which makes it difficult to predict whether the increase reflects a long-term upward trend in fatalities across the District. Because DDOT designs, builds and maintains roads, the department plans to continue promoting road projects that involve Vision Zero principles, like “slow things down” and “increase multi-mobile safety” for everyone who travels in the District, Branyan said. Daniel Dulaski, a civil and environmental engineering teaching professor at Northeastern University, said traffic fatality data does not always tell the “whole story” of why incidents may have occurred. He said people did not drive as frequently during the 2008 economic recession, reducing the number of drivers and crashes. “When you look at the crash frequency, the number of crashes from year to year, it doesn’t give you the proper picture,” Dulaski said. Dulaski said cities should redesign roadways to include more curves to slow drivers and help mitigate traffic fatalities. He said city officials should also issue more public service announcements about traffic safety. “There are a lot of things that we could be promoting that we’re not promoting as a society to make the driving environment safer,” he said. Madeleine Deisen, Sarah Roach and Mark Warburton contributed reporting. Language in a paraphrase from Alaina Gertz was updated to clarify that an increase in walkers, bikers and scooter riders has contributed to an increase in traffic fatalities.